This salad can be your entree by adding the meat or meat substitute of your choice. This is usually my appetizer. It is very tasty! Be sure to make plenty, you just might want to have another helping. Press garlic and let it sit for 5 min. Chop onion and soak in hot water and vinegar while preparing the salad. Whisk together salad dressing ingredients, adding olive oil at the end slowly. Wash and dry baby arugula. Squeeze out excess liquid from the onions. 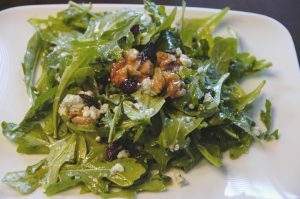 Combine onions with the arugula and toss with dressing. Sprinkle walnuts on top. Thanks. This looks good. I like all the salads that my husband calls “weeds” as they have more flavor. Love your recipes! You are my hands down very fave low carb blog. Thanks! I also really love all your recipes with coconut flour and products. I am allergic to both soy and almond, with many low carbers use…but your recipes are great. I have tried many and had perfect results! I love arugula salads. I just made some dried cranberries today. Dinner tonight. I assume the 1 tablespoon of hot water should be the vinegar?? ?